By default, you initiate autofocusing on your Rebel T6/1300D by pressing the shutter button halfway and lock autoexposure by pressing the AE (autoexposure) Lock button. You should stick with this setup while learning about your camera; otherwise, the instructions in the camera manual won’t work. But after you feel more comfortable, you may want to customize the locking behaviors of the two buttons. To configure the buttons, set the Mode dial to P, Tv, Av, or M. Then head for Custom Function 8. You can choose from the following configuration options. The part of the option name before the slash indicates the result of pressing the shutter button halfway; the name after the slash indicates the result of pressing the AE Lock button. Adjust autoexposure and autofocus lock behavior via Custom Function 8. AF/AE Lock: This is the default setting. Pressing the shutter button halfway initiates autofocus; pressing the AE Lock button locks autoexposure. 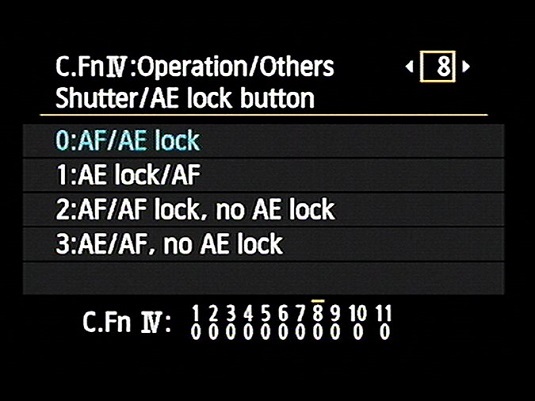 AE Lock/AF: With this option, pressing the shutter button halfway locks autoexposure. To initiate autofocusing, you instead press the AE Lock button. In other words, this mode is the exact opposite of the default setup. This option is designed to prevent focusing mishaps when you use AI Servo autofocusing. In AI Servo mode, the autofocus motor continually adjusts focus from the time you press the shutter button halfway until the time you take the image. This feature helps keep moving objects focused. But if something moves in front of your subject, the camera may mistakenly focus on that object instead. To cope with that possibility, this locking option enables you to initiate autofocusing as usual, by pressing the shutter button halfway. But at any time before you take the picture, you can hold down the AE Lock button to stop the autofocusing motor from adjusting focus. Releasing the button restarts autofocusing. Exposure is set at the time you take the picture. AE/AF, No AE Lock: In this mode, press the shutter button halfway to initiate autoexposure and press the AE Lock button to autofocus. In AI Servo mode, continuous autofocusing occurs only while you hold down the AE Lock button, which is helpful if your subject repeatedly moves and then stops. Exposure is set at the moment you take the picture.